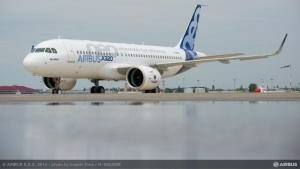 To match ongoing high demand for its bestselling A320 Family, Airbus has taken the decision to further increase the production rate of the Single Aisle Family to 60 aircraft a month in mid-2019. The decision follows thorough studies on production ramp-up readiness in the supply chain and in Airbus sites to allow the ramp-up. To enable the ramp-up Airbus will extend its capacity in Hamburg with the creation of an additional production line. In parallel Airbus will integrate cabin furnishing activities for A320 aircraft produced in Toulouse into the Final Assembly Line in Toulouse, and thereby harmonising the production process across all A320 Family Final Assembly Lines worldwide. The A320 Family is the world"™s best-selling single aisle product line with over 12,200 orders since launch and more than 6,700 aircraft delivered to more than 300 operators worldwide. Thanks to their widest cabin, all members of the A320 Family offer unmatched comfort in all classes and Airbu"™ 18" wide seats in economy as standard. With one aircraft in four sizes (A318, A319, A320 & A321), the A320 Family, seating from 100 to 240 passengers, seamlessly covers the entire single-aisle segment from low to high-density domestic to longer range routes.